ST. LOUIS (DTN) — Tom McGraw has seen a lot of changes in agriculture over the past six decades, but soil sampling isn’t one of them. The importance of improving the quality of soil sampling was a popular topic at this year’s InfoAg conference, an event produced by the International Plant Nutrition Institute to showcase the latest developments in precision agriculture. As agricultural software companies develop increasingly sophisticated data analysis and mapping software to examine and use soil samples for variable-rate fertilizer and nutrient application, the sampling method itself has remained stubbornly low-tech, labor-intensive and vulnerable to human error. However, a smattering of companies are now bringing automated soil sampling equipment to the market, ranging from small ATV attachments to tractor-hauled units. They hope automation can help improve the lowly but crucial step of securing a quality soil sample that will determine how a farmer spends valuable time and money improving the fertility of his field. Allan Baucom has been using grid soil sampling on his farm in North Carolina for nearly 20 years. “Soil sampling has always been a chore,” he told DTN. For decades, farmers have walked their fields and taken soil samples by plunging a hollow metal probe into the ground to a designated depth and then depositing the resulting core of soil into a container. Most experts recommend fields be broken into 2.5-acre grids for sampling with at least 12 cores taken for each sample, so the process can be extremely time consuming, McGraw said. Given the potential for the wide variability even within a 2.5-acre region of soil, the chances for unrepresentative samples are quite high, he added. Other complicating factors include the moisture and temperature of the field’s soils, the time of year, the field’s tillage history, soil compaction, the freeze-thaw cycle, and the fact that nutrient levels vary by soil depth. Add human error to the equation — cores taken at inconsistent depths, too close or too far apart, and not mixed properly — and the chances of reliable, representative and consistent samples sink even lower, McGraw said. Yet the integrity of each soil sample is critically important for every step that comes afterward. The data gleaned from the soil lab analyses, the field maps generated from that data, and the decisions the farmer makes in adding fertilizer and nutrients are all based on the dirt that finds its way into the soil sampling bucket back in the field. Even with employees trained specifically to sample soils on Baucom’s 14,000 acres of cotton, corn, soybeans, wheat and vegetables, he knew the samples were likely not perfect. So Baucom launched Falcon Soil Technologies and designed an automated soil sampling unit that can be towed by a pickup and controlled from your laptop. “We wanted it to be simple, functional and farmer tough,” he said. The 2,200-pound unit contains a 5-foot-tall hollow stainless-steel wheel with a probe attached. As the wheel rotates, the probe plunges into the ground every 15 feet to collect a core, mixes them, and when prompted, funnels them into a rotating carousel that can hold up to 12 samples. A GPS unit on board logs the location of every soil core taken, and the final sample is imprinted with a bar code. A box in the back of the unit can store multiple carousels of samples. The company recommends field speeds of 8 to 12 mph, which allow the Falcon unit to collect 40 or more cores every minute. The Falcon 5000 soil sampling unit costs $58,850 and joins a growing number of other automated soil sampling machines on the market. 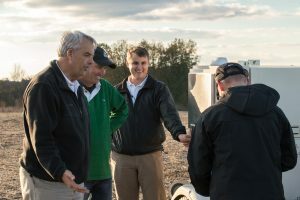 For two years, Jim and Jeff Burton’s company, AutoProbe, has been selling a soil sampling attachment designed to be pulled by any tractor with a 3-point hitch and hydraulics. The AutoProbe unit consists of a rubber track with a probe that collects a soil core every 8.5 feet. The core is blown through tubes into the cab of the tractor and into a sample bag that can be switched out by the driver. Jim is proud of AutoProbe’s speed; the company claims a tractor moving 5 to 7 mph can sample 150 acres in just an hour. The unit lists at $79,900, and Burton said 20 of the machines are now running on farms in North Carolina, Iowa, Illinois, Indiana, Missouri and Arkansas. On the lower end of the cost and equipment spectrum are smaller automated soil sample units such as the Wintex 1000 from Precision Technologies, which retails at $8,250. This small soil sampling unit attaches to the back of an ATV, and the company claims it can take 38 soil samples (of 12 cores each) in an hour. While automated soil sampling equipment can’t take all the variability out of soil sampling, it can improve the consistency of soil cores and lower the chance for human error, Baucom said. “The goal is to get a good, representative, homogeneous sample of that ground that can be validated and replicated,” he said.